The roadshow is put together by organisations responsible for informing citizens about the European Union or for implementing EU programmes, such as Europe Direct, Eures, Erasmus and EU careers offices and takes place under the auspices of the Greek Representations of the European Commission and the European Parliament. As the EU’s reference centre for vocational education and training, Cedefop has been a partner and patron of the jobs and mobility roadshow since its first edition three years ago. This year’s roadshow was organised by seven Europe Direct information centres and visited, during eight days, six cities across Northern Greece – Komotini, Kavala, Nea Moudania, Thessaloniki, Kerkyra and Ioannina – and Patras in the south. 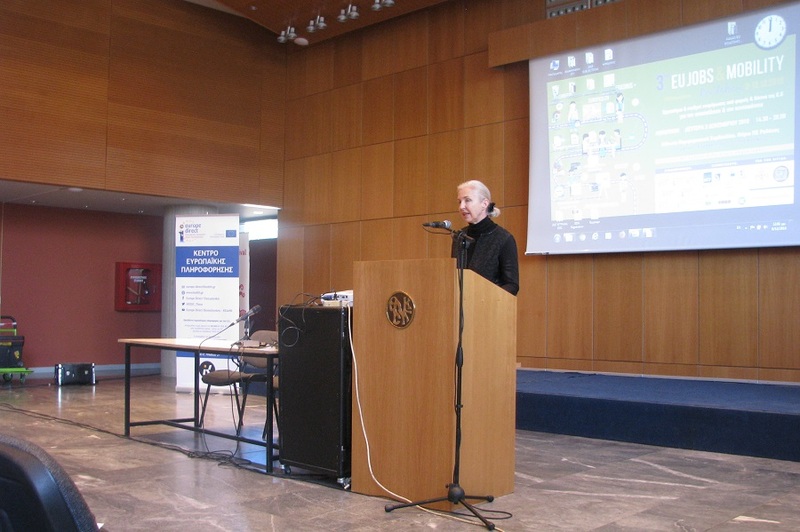 At the Thessaloniki event on 6 December, Cedefop expert Corinna Frey presented the agency’s work, which is closely linked to the options and opportunities offered to the Greek public by the roadshow’s various actors. To help European citizens work and learn abroad, Cedefop has fostered among EU Member States, for more than 40 years, mutual understanding, validation and recognition of qualifications. With its research and policy proposals, including the European qualifications framework and Europass, Cedefop has contributed to the groundwork underlying many EU programmes and initiatives promoting European citizens’ mobility. The roadshow is part of the European vocational skills week, an annual activity organised by the European Commission in close cooperation with Cedefop. So far this year, the week, which in reality spans from September to December, has hosted more than 1 800 events in 45 countries. Cedefop has contributed with some of its own events, its participation in the jobs and mobility roadshow and with the #CedefopPhotoAward.